In Janurary of 2006, Sabian introduced another line of cymbals produced in collaboration with Dave, called HHX Legacy. Comprising 14" Hi-Hats, 10" and 12" Splashes, 17" and 18" Crashes, 20" and 21" Legacy Rides, a 22" Heavy Ride, and a 20" Ozone Ride, Legacy is a deeper, darker contrast to the brighter sound of Evolution. 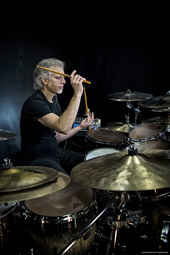 Once again, Dave worked with Sabian master product specialist Mark Love, who said: "Legacy is one of the most in-depth cymbal projects Sabian has undertaken, with Dave Weckl testing various prototypes in performance and recording situations over several years. The 'Tone Texture' feature of Legacy stems from Dave's desire to have deeper, darker sounds combining with rich musical tonalities, creating an extended tonal palette." Added Dave, who plays Legacy on their own or mixes them with Evolution models: "Legacy is the darker side of my sound. These cymbals are vibrant, trashy and beautiful...all at once. 'Tone Texture' gives these cymbals a great deal of dark, musical color that encompasses the full tonal spectrum but digs way down deep, for a broader, more complex tonal personality. The hats 'speak' crisply and cleanly, but always with that simmering HHX tone. The Legacy Ride has great articulation over a dark cushion of sound, while the Heavy Ride is big, clean and crisp yet warm. The crashes are punchy, dark and complex. They're designed to punctuate without overpowering. For something different there's the O-Zone Ride which has five 2" holes in its upper half and is great for riding or crashing; I can sit back on it or dig in and stir up a turbulence of dark, angry tone. 'The 'Tone Texture' of these cymbals makes Legacy a compelling consideration for any drummer looking for sounds that offer a new richness to their playing." According to Love, the Legacy sound has been created using a wide variety of unique designs and a wide mix of creative methods. He added "Dave is extremely particular about sound, so each model in the Legacy line was created on the basis of the sound he was seeking, so various hammering and lathing techniques have been employed by our artisans." Dave concluded: "From my experience Sabian is the most open-minded cymbal company ever. I've never met cymbal makers who care so much about every aspect of the cymbal making process. From developing the concept, to designing the cymbal, to shaping the metal, to creating the sound... nobody does it better than Sabian." Legacy cymbals are individually handcrafted from Sabian B20 'cast' bronze. They are available exclusively in Natural Finish, and are quality-protected by a special Sabian 2-Year Warranty. Click here to search the Sabian dealer network. In 2001, Dave was invited to create a collection of cymbals with Sabian, a company he describes as "one of the most innovative and caring family companies that I am happy to be associated with." This experience lead to the creation of one of the industry's most popular cymbal lines - the HHX Evolution Series. Creating the HHX Evolution line was a team effort, and the team impressed Dave throughout the process. Dave worked for many months with Mark Love, Sabian's head cymbal maker, and an extremely talented group of individuals dedicated to the craft. Dave learned a lot about the cymbal making process during the design and development of the HHX Evolution Series. "We went through rounds and rounds of prototypes," he said, "and there was no stopping them (the team). With each round, we came closer to what I was looking for." He was constantly impressed by the skills of Mark and the Sabian craftsmen. But what truly impressed Dave was the team's ability to understand what he wanted and methodically work toward a sound and feel that he had been dreaming about for so many years. "It all came full-circle for me," Dave said. "After years of playing cymbals and learning to get what I wanted from them, the cymbals themselves were giving me the sounds, textures and feel I wanted...naturally." 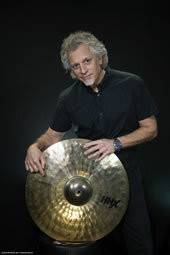 So, where is the big Dave Weckl signature on the cymbals? You better look closely. "My idea was to help create a cymbal that would speak for itself," Dave explains, "with beautiful sonic qualities, for lots of different music styles, and for many years of usage." It is for this reason that Dave felt it better to understate his involvement on the cymbals themselves, having only a small signature on the underside of the bell. He even asked Sabian to minimize all logos; to give the collection a classy look and feel. As for the way they play, Dave says, "I wanted a cymbal that invited you to play it with no resistance, speaking with incredible clarity and brilliance, air, and atmosphere. I insisted they be the most consistent cymbal made, which I firmly believe we have achieved due to strict weight constraints in the manufacturing process (there are no thins, medium thins, heavies, etc.)." "Just like the music making experience, this was a true team effort, " Dave adds. 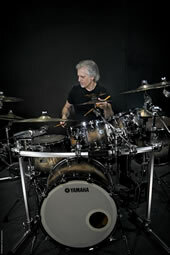 "I want to personally thank the founder of Sabian, Robert Zildjian, for inviting me to the team. 5" x 14" 6-ply 6mm Maple Shell The thin Maple shell combined with the 5" depth gives the Yamaha Dave Weckl Signature Snare Drum great versatility. You can tune it low and fat or crank it up to cut in a loud musical situation. Dual Strainer Design - The Dave Weckl signature snare drums have a unique dual strainer design that uses snares of two different compositions. Dave prefers to have tight tension on the hi-carbon snares and loose tension on the stainless steel wires. Nouveau Lugs - The quick release, low contact lug makes it easier to change heads in the studio and gives the drum a very wide dynamic range. 8-lug Aluminum Die Cast Hoops - The Aluminum die cast lugs give you precise tuning while maintaining an open, warm tone. Using only 8 lugs gives accurate tuning with minimum metal on the shell. Solid Black finish - Yamaha's legendary Solid Black is like no other. Yamaha hand-finishes their drums using the same technique that is used on their grand pianos. 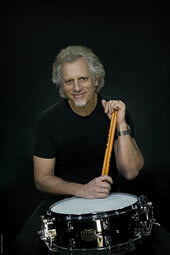 Dave Weckl signature snare drums are not currently in production, but you can find them for sale online using Google. In Yamaha's quest to continually expand the boundaries of musicality for drummers, the company used newfound Asian woods to create the PHX kit. "These particular woods, jatoba and kapur, have never before been used to make drums, and when you put them together in a specific combination, they produce an amazing musical tone," says Dave Jewell, marketing manager, Yamaha Drums, Pro Audio & Combo Division. "We've discovered one of nature's secrets." In addition to sounding great, the 11-ply shells are a sight to behold. The center ply, jatoba, is an extremely hard wood that provides the drum's core note. On either side are four plies of kapur, which is a softer wood than jatoba. The inner and outer plies of the shell are customized, using maple or a combination of a burled ash outer ply and a maple inner ply. The concept behind the PHX shell construction is to use the hardest wood in the middle surrounded by softer plies of wood; this produces a sonic "ripple effect" similar to the sound a pebble creates with waves when dropped in water. "The trend today is thin shells, but frankly, these drums—made with this specific wood combination — do not sound 'thick,'" said Jim Haler, product manager, Yamaha Drums. "They go against every sonic standard of a thick shell." Joe Testa, Yamaha Drums international artist relations manager, added that "We brought these drums into the studio with some of our top artists, and the difference is astounding. I describe it this way: when most drums are struck, the sound comes from them and hits you. With this kit's sound, it hugs you. Imagine your current Yamaha sound with a natural preamp on it. Generally, a kit's sound improves with age. On the PHX, the aging process seems to be accelerated. Within just a week of playing it, the sound matured immensely. It really is beautiful." Not only is the shell construction a new venture for Yamaha, the kit's new and improved mounting system is, too. Developed to make the fundamental tone of each drum clearer and better defined, the wooden tom mount, combined with shock-mountable rubber contact points, provides ultimate resonance. As with all Yamaha drums, the mounting points are positioned at the nodal points of the shell. The newly designed detachable lugs are mounted where the overtones are the highest. The balance of the nodal point mount and the overtone point of the lugs help mute unwanted overtones, making the fundamental tone come alive with much more clarity. "The PHX was not made to replace our current high end drums, but rather to supply drummers with another musical voice in their arsenal," said Jewell. "Yamaha Drums will continue to create instruments that further a musician's capability to create better music. We pride ourselves in being the choice for those serious about their music." Click here to find a Yamaha dealer near you. The EVOLUTION signature stick was designed by Vic Firth and Dave to correlate with changes Dave made to his playing approach in the late '90s. It has a slightly heavier front end than his original signature stick (the red one), producing a great balance from a 'center of gravity' balance point, allowing rebound to happen with very little effort. It is similar in size to a 5A, with a different tip and different balance in the front end. The SDW features a barrel tip for a broad cymbal sound. It's fast, with great leverage, and is available in wood or nylon tip (SDWN). L = 16 1/4", Dia. = .560"
The SDW2 features a short tear drop tip on a 5A shaft. It provides superior cymbal definition with excellent rebound. It is also now available with a nylon tip. L = 16", Dia. = .563"
Click here to shop for Dave's sticks. Dave had the idea for an active snare muffler for a long time. With the help of Herbie May, at Remo, it is now a reality. Putting something on the head like tape or rings constantly muffles the drum, affecting the sound and feel drastically. But the active dampening system has a floating plunger that acts like a physical noise gate, moving off the head upon impact to allow the drum to breath, then it coming back down to muffle the drum depending on your taste. 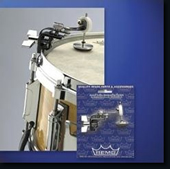 The system was designed for snare drums, but can also be used on toms. In either case, the drum sound retains much of the feel. It is adjustable enough to clamp to most any rim. Click here to learn more on the Remo Web site. Dave and Herbie May, from Remo, designed this bass drum muffling system. It was based on a concept Dave learned from Simon Phillips, which was to roll up a towel and tape it to the head and shell. This system uses a felt-covered tube that lays on the shell next to the head, fastened with clamps that velcro to the shell. The clamps can be moved in tight or further away from the head for the desired dampening. 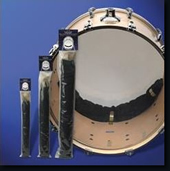 It comes in three sizes for 22", 20" and 18" bass drums. The smaller 18" version works well on the front head too. Click here to purchase on the Remo Web site.